To make a point about campaign finance corruption involving 501(c)(4) social welfare organizations, PACs, and Super PACs, Harvard Law professor Lawrence Lessig started what appeared to be a quixotic campaign for the Democratic nomination for president. His idea was that he would run simply to overturn the nation’s horrendous system of campaign finance and then turn over the White House to his vice-presidential running mate, who would be addressing the rest of the traditional presidential plate. Key to his potential campaign was raising $1 million—not from PACs or other dark money groups, but from regular people, through Kickstarter. Lessig’s campaign may be no less quixotic today than it was a month ago, but it is gaining steam. He has raised, he says, $750,000 so far toward his September 8th deadline and has been pushing campaign finance reform onto the agendas of some of the other presidential candidates. Lessig complains that as a priority, campaign finance reform is 15th on Martin O’Malley’s list of 15 top issues for his first term, but Bernie Sanders has boosted the issue from eighth to second on his list. Nonetheless, it must be hard for some potential voters to wrap their heads around the idea of a president who would take office for the purpose of passing one item—the Citizens Equality Act (yet to be written)—and then resign. 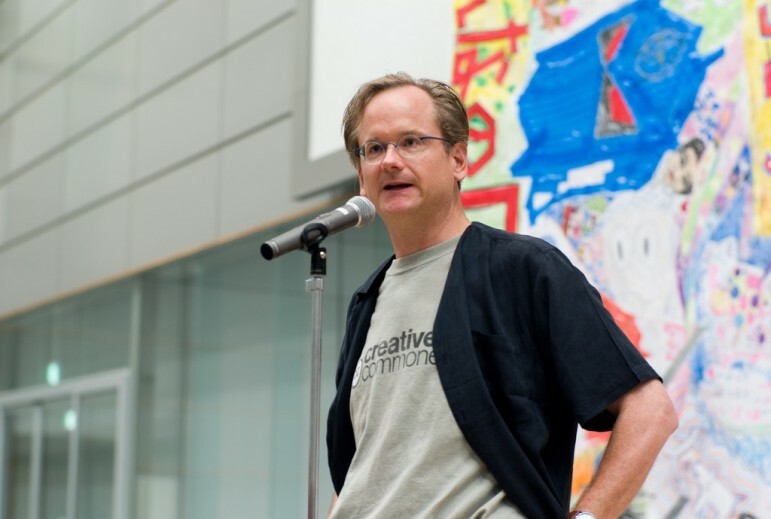 At AlterNet (and rerun at Salon), Steven Rosenfeld has penned a devastating critique of Lessig’s single-issue campaign and the friendly signals Lessig has sent to none other than Donald Trump. Rosenfeld notes that Lessig has spoken positively about Trump’s commentary that big donors have essentially purchased the loyalty of Trump’s Republican primary opponents and even suggested that if the Donald were to make a third-party campaign focused on campaign finance with a promise to resign after achieving needed reforms, he might be willing to sign on as his running mate. This is the danger of single-issue politics: seeing the light and being blinded by it. The problem is not that Lessig’s analysis of the problem is wrong. His remedies, including a national system of publically financed elections, are also correct—that, too, has been proven over the years in states and cities to be a generally better approach than the endless dialing-for-campaign-dollars status quo. The problem is the most public leader of the democracy reform movement in 2015 is not showing political skill or judgment by jumping on the coattails of the ever-unpredictable Trump. It looks like a desperate measure in a desperate time, and cheapens the issue—and his compelling analysis—by flirting with today’s biggest political bomb-thrower. As Lessig’s campaign evolves, it looks like he is discovering the difficulty of a single-issue candidacy laser-focusing on a single issue. David Weigel’s article in the Washington Post noted that Lessig visited Ferguson, Missouri earlier this week and commented on the people being harmed by “taxation by citation,” though he found a way of returning that to his campaign theme of the corrupting influence of campaign finance. In fact, as Mark Schmitt pointed out in Vox, Lessig has been careful not to focus the Citizens Equality Act exclusively on campaign finance reform as a silver bullet, but to include other topics such as voting rights, perhaps ranked-choice voting, weakened legislative gerrymandering, and incentives for small-donor participation in campaign contributions. Moreover, knowing how inordinately long it can take to pass a constitutional amendment, Lessig and the chairperson of his campaign finance reform PAC, Zephyr Teachout, talk about campaign finance reform legislation that would pass constitutional muster and criticize candidates such as Hillary Clinton who call for campaign finance reform but link it to the need to amend the constitution to undo the Citizens United decision. The hubris of the Harvard Professor is breathtaking. In virtually every respect, his strategy is absurd. Lessig’s political reform agenda is stymied by Republicans, not Democrats. Why not direct his energies where the opposition resides? All of the current Democratic presidential candidates support the thrust of these reforms. But saying that this is their highest priority is likely to harm, not boost, their candidacies. Why would even the most ardent supporter of the three pillars of Lessig’s reform agenda cast a ballot solely on this basis? Big and important issues divide the two parties today and the stakes of public action or inaction are huge. We don’t have the luxury of using the election to try to build a mandate for a set of political reforms that would have no chance of passing in the face of GOP opposition and would be of only incremental utility if they did. Campaign finance does play a corrosive role in our democracy and I have invested much of my career grappling with it. There is no doubt that money in elections facilitates the transfer of economic inequality into political inequality, and the spectacle of several hundred plutocrats dominating the finance of our elections should be a target of serious reform efforts in the courts and the Congress. At the same time it is foolish to imagine that campaign finance is the only route for private wealth to influence public policy or that its reform will dramatically transform the policy process. Money did not prevent the major legislative enactments of 2009-2010—including the stimulus, student loans, the Affordable Care Act, and financial services reform. Nor is it likely to be the critical factor on climate change, immigration, infrastructure or jobs and wages; which party wins the White House and whether control with Congress is unified or divided is key. If anything, the Lessig campaign is likely to weaken the forces for political reform by demonstrating just how small the relative priority for this action is. Having trouble getting that corporate foundation gift? Try adding a well-placed politician to the board!